Gouverneur Morris of Pennsylvania was put in charge of the committee to draft the final copy and co-authored the final language of the Constitution of the United States, based on the discussions and resolutions of the Continental Congress. Physicians and politicians resemble one another in this respect, that some defend the constitution and others destroy it. Acton or the Circle of Life : A Collection of Thoughts and Observations (1849), 190. 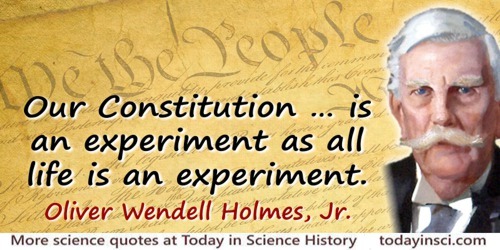 Our Constitution … is an experiment as all life is an experiment. From Dissent in Abrams v. U.S., p. 304, quoted in Saturday Review (1929), 6, 582. Of all the supervised conditions for life offered man, those under U.S.A.’s constitution have proved the best. Wherefore, be sure when you start modifying, corrupting or abrogating it. The Constitution never sanctioned the patenting of gadgets. Patents serve a higher end—the advance of science. Concurring in Great A. & P. Teas Co.. V. Supermarket Equip. Corp. 340 U.S. 147, 155 (1950). In Eugene C. Gerhart, Quote it Completely! (1998), 802.